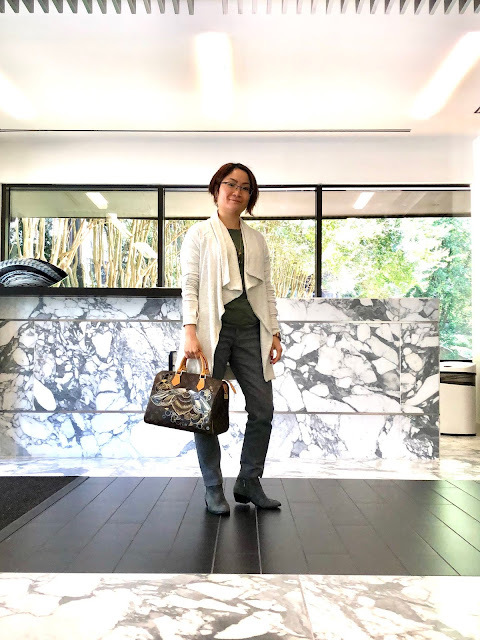 Petite Impact: National Handbag Day! 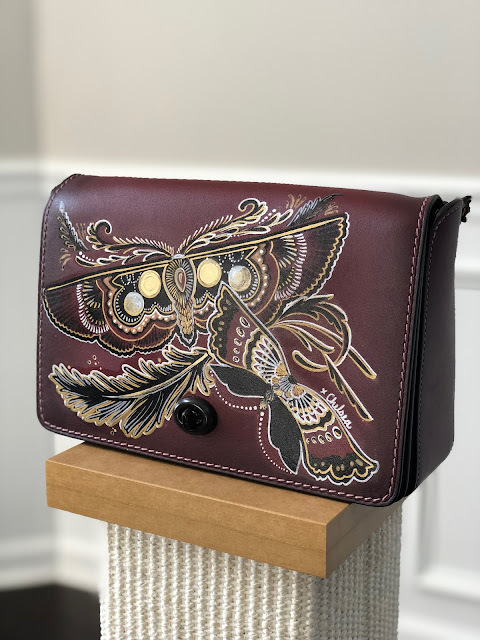 When I saw Coach's new fall line featuring moths and skulls, I fell in love. I found out the artist behind it all is Chelsea Champlain. Digging some more, I found her instagram page and sent her a message after seeing she does commission pieces. I decided to send her my LV Speedy and Coach Dinky 24. The Speedy was a no brainer. She did mention that she never painted on a LV before and was very excited to be given the chance to do so. The Dinky I already had in mind that I wanted some kind of design on it and I was originally toying with the idea of going to Coach and having them customize it with prairie rivets. I couldn't be happier deciding to go with Chelsea and her artwork. 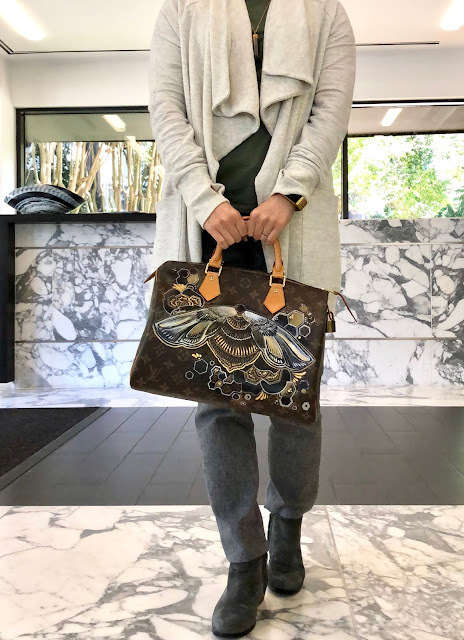 I'm super obsessed with the honeycombs and the bee on my Speedy. It's so nice to have a one of a kind bag that no one will ever have. Speedy's are so common, everyone and their great grandma owns one. Chelsea is very humble and so easy to work with. 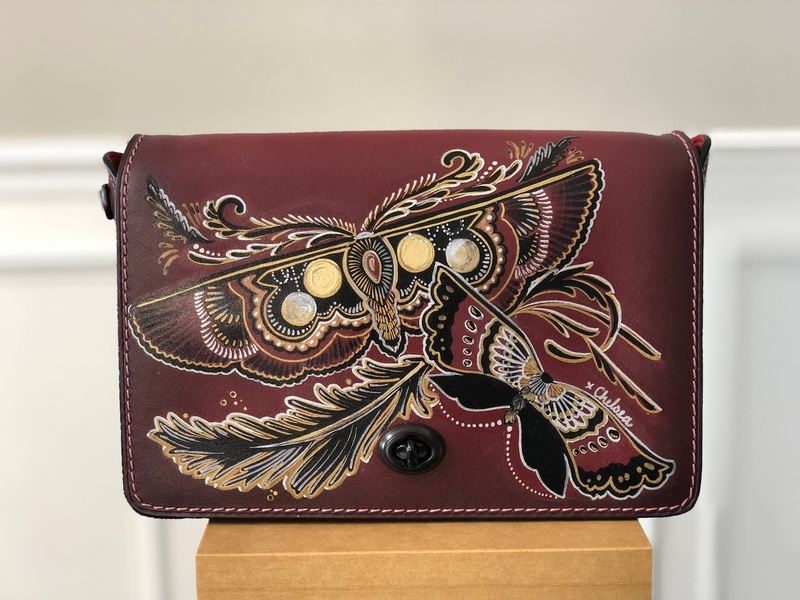 Acrylic paint is what she mainly uses on the bags along with leather finisher to help protect the art work when she's done. I let her know I wanted bees on my Speedy and moths on my Dinky. I kind of let her do her own thing, I wasn't too specific with the design. However, if you are looking for something very specific definitely let her know. I kind of gave her free reign. The Dinky came out absolutely gorgeous on the first try. I didn't ask for any changes. For the Speedy I did have her add some more honeycombs around the bee and also asked for a little more detail along the wings and body. Chelsea was very accommodating with my request to make changes. How gorgeous is the Dinky? The Dinky comes in two sizes. There's the regular and the 24. I prefer the 24 just because it can fit more things whereas the regular size feels just a tad too small sometimes. 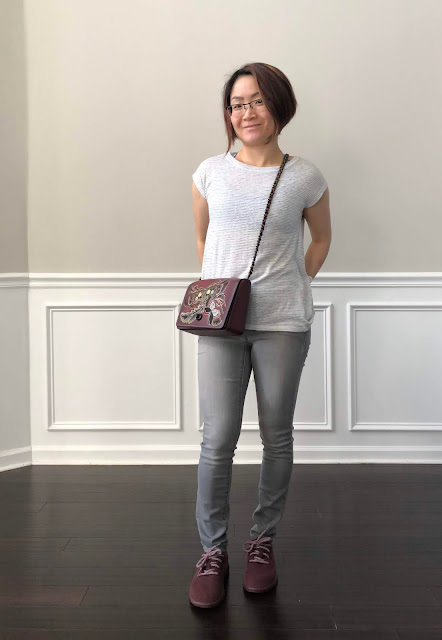 I should add if you're walking around all day with the Dinky 24, the strap can start to dig into the shoulder if you carry it crossbody. I know what you're thinking, what are her prices like? It depends on the size of the bag and what you want on it. I think her prices are very reasonable. The Speedy 30 cost $250 and the Dinky 24 cost $160. I wouldn't be surprised if she will raise her prices soon. When I contacted her back in August she said the turn around time was about a month. Now it's about two months. I'm very tempted to send her a black bag so I can get skulls painted on it. I can't help it, it's the goth girl in me. Check out my new Allbirds! 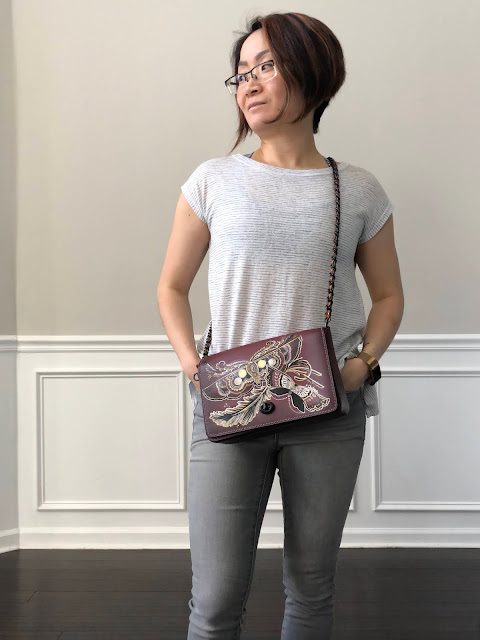 If you happen to have a bag that's just sitting in your closet and not getting any love, I totally recommend sending the bag in for customization! It will totally spiff up the bag and make it new again. That's it for me, hope everyone has a wonderful weekend! Not a moth person but the bags are so pretty and one-of-a-kind! I personally like the Speedy better because of the colors, but both are so unique! You’re going to get lots of compliments I’m sure! 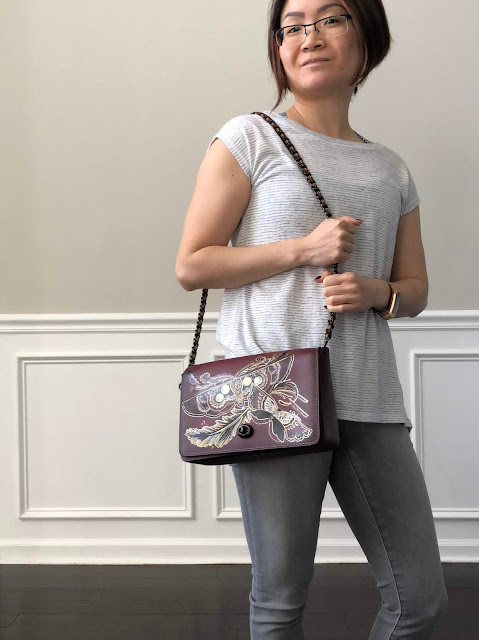 Handbags will always be my #1 weakness. I just love pretty things I can't help it. This definitely satisfies me! I'm afraid of moths but those designs are really pretty. I'd love to see an AllBirds review! I'll have a review of the Allbirds coming right up! I love what she's done with both of your bags! I too own a speedy 30 which I never carry...I bought it in Paris about 7 years ago and have used it maybe 5 times. I also have an 11 year old speedy 25 which I use a lot more often. I am thinking of getting the 30 monogrammed, but part of me thinks I might sell it one day (I have already sold my damier 30, 25 and azur 35 and pochette, I used to be an LV addict! ).